I’ve already utilized the data in four rental apartment studies for developers over the past five weeks! 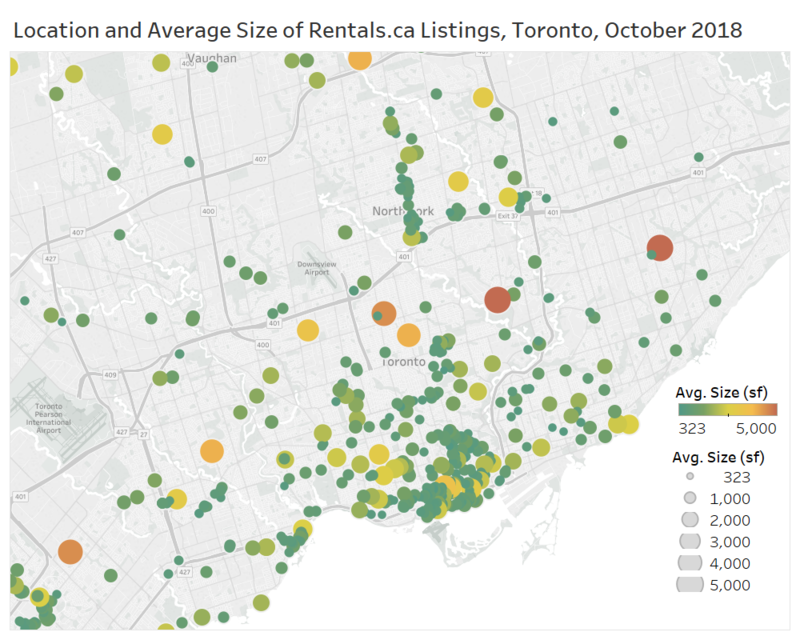 With limited real-time data on the rental market, this data has really helped me understand the markets better. There is so many ways the data can be sliced and diced, so I wanted to put up a couple more charts. 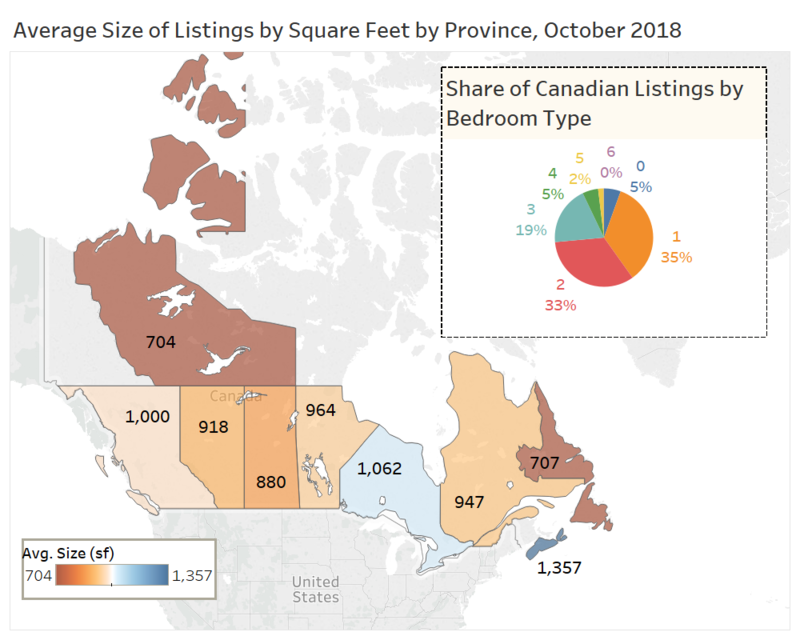 In terms of the size of units for lease by province, Ontario has the largest units for rent on average at 1,062 sf, compared to just 704 sf in the Northwest Territories (sample size is small). 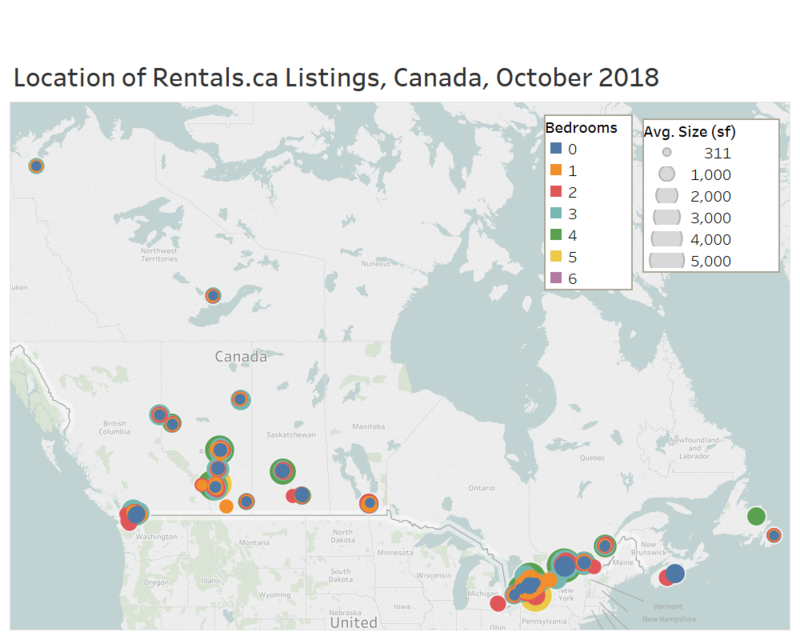 One bedroom units account for 35% of all units for lease on Rentals.ca in October, with two bedroom units account for 33% of the suites available. These is a fair amount of single-family product available as well with three bedroom units capturing 19% of the market share, well ahead of four bedroom (5%) and five bedroom (2%). 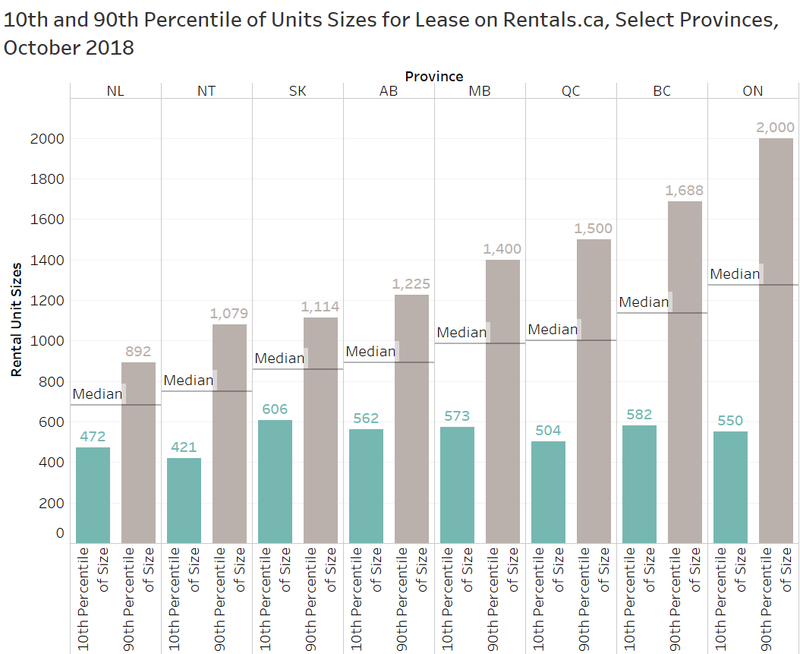 When eliminating the outliers, and looking at the range of units available for lease by unit size, you can see how different the rental markets are across the various provinces in Canada. Zooming in on the City of Toronto, we can look at the average unit sizes by location. There are limited rental options in the “outer 416” area. The chart below shows the average unit sizes for lease by built form and former municipality. There are relatively large single-detached and semi-detached homes for rent in North York, but much smaller single-family homes for rent in the former City of Toronto. 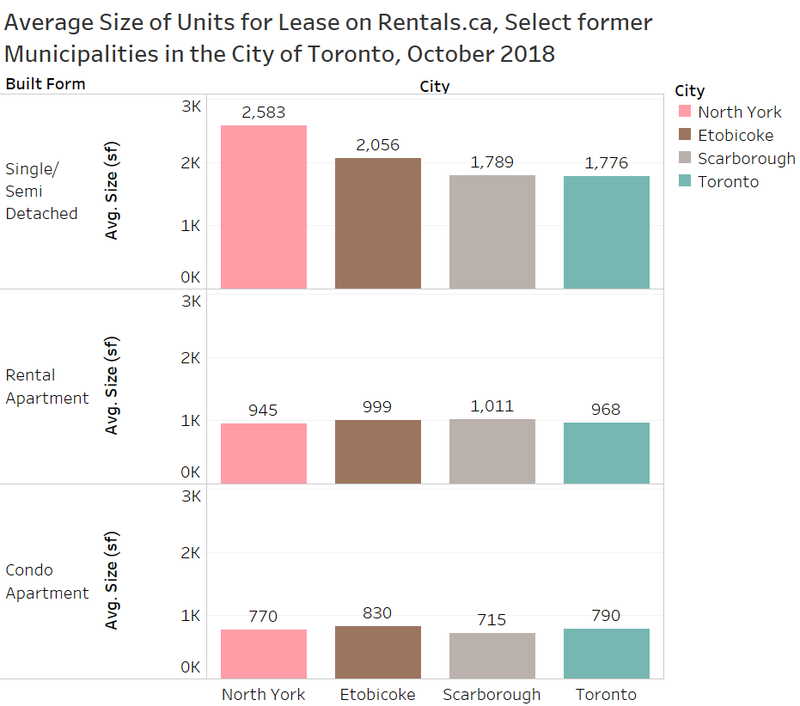 The stock of rental apartments are much older and larger, while condo apartments for rent have continued to decrease in size, with Scarborough having the lowest condos for rent at 715 sf on average. The new mortgage rules, higher interest rates, strong population growth, rising condo prices, and uncertainty in the low-rise resale market are all adding significant rental demand. Although new condo completions are expected to rise in 2018 and 2019, the increase is being offset by a decrease in listings among the existing stock. This decrease in condo rental turnover can be tied to the new expanded rent control legislation that causes tenants to stay in their unit longer when rents are rising above the ‘”rent increase guideline” set by the Ontario government. If you’re looking at building a new rental and are still working off your rental rate assumptions from 2017 or early 2018, give me a call, and we can update your revenue assumptions and review your unit mix and suite sizes based on today’s market data.